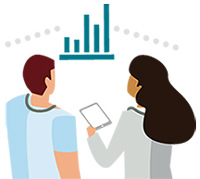 Learn even more about your practice by signing up for a confidential report that includes personalized data, along with suggestions to support you in improving care for your patients. Learn how our VP of Clinical Affairs, Dr. David Kaplan used his own practice report to discover that many of his patients were filling opioid prescriptions they had received from someone else, and how this led him to ask his patients additional questions during routine health exams. Read his story. Tools to help manage your patients’ pain (including appropriate use of opioids) from partners across the province. The MyPractice report will only be sent to the email address you provided upon registration and will not be shared with others, including other agencies or physician groups. What’s included in MyPractice report? MyPractice: Primary Care report will provide you with confidential information about your own practice, in relation to peers across the province. This report gives you your opioid prescribing patterns compared with others. In addition, you can see how your patients are doing with their cancer screening and diabetes management – and learn how they are using other health services, like emergency departments. This means you will be able to take what the data is showing you about your individual practice and use your patients’ electronic medical records to find specific patients in need of attention. Plus, you will get practice ideas specific to improvement topics, which can mean less effort and time having to search for solutions that may already exist. This report is not available for anyone else to see other than the physician who requests it. View the sample Physician Report for additional details. *This report does not contain real data, and is intended only as an example of what the MyPractice Report contains. Will my report be shared with the College of Physicians and Surgeons of Ontario? Your MyPractice report will only be sent to the email address you provide upon registration and will not be shared with others, including other agencies or physician groups. The data and practice ideas featured in your confidential MyPractice report are specific to your practice to help you better understand your patients and how you can support them. Can I receive CME Credits by signing up for MyPractice Reports? Yes, this report can be the basis for a Mainpro+ Certified Practice Audits/Quality Assurance program. Each completed exercise is eligible for six certified assessment credits. How do I receive MyPractice report? You can receive a confidential MyPractice report by completing the consent form found here. Once your consent has been provided, a Health Quality Ontario account will be created to allow access to the reports. If you already have a Health Quality Ontario account, please sign in and complete the consent form. When can I receive my report? *Dates are dependent upon data availability and are subject to change. Is the data in the report confidential and secure? The data in the report is confidential and secure. Health Quality Ontario will only release identified/identifiable physician level data to the participating physician. Identified/identifiable physician data will not be shared with other parties without additional written consent of the participating physician. For more information about how Health Quality Ontario manages and safeguards personal information, please review our privacy notice at www.hqontario.ca/Policies-and-Procedures/Privacy-Policy. How can I use the Ontario and Local Health Integration Network (LHIN) percentages that are provided in the report? The Provincial/Ontario and LHIN percentages found in your report are provided for context only and do not represent a target. What other supports are available to me as I help patients manage pain? The MyPractice report was developed jointly by Health Quality Ontario and the Institute for Clinical Evaluative Sciences, in partnership with the Association of Family Health Teams of Ontario, Association of Ontario Health Centres, and the Ontario College of Family Physicians. How does this report compare to others developed by primary care organizations across the health care system? The MyPractice report examines data specific to your practice, to identify gaps and to offer practice ideas for improvement. These reports show information about your practice in relation to others in the province. Also, no patient-level data are reported. Please view a list of other primary care reports that support quality improvement at the local level click here. Are these reports just for family physicians? A separate report with aggregate group level is available to executive directors of Family Health Teams and Community Health Centres in the primary care sector. Individual physicians are not identified in this report. Before receiving their report, executive directors must confirm that no physicians in their Community Health Centres or Family Health Teams objected to having the executive director receive the aggregate level report. Is the MyPractice Primary Care report available to all family physicians? The report is available to non-salaried family physicians who work in a comprehensive family medicine office setting. Unfortunately, the report is not currently available to family physicians who are part of a salaried model of care, such as Community Health Centres, and family physicians who have a focused practice, (e.g. emergency departments or pain management). This is because each physician’s report is based on rostered and ‘virtually rostered’ patients, and those who do not roster/ virtually roster are not able to receive a report. Virtual rostering is an algorithm that attributes physicians to patients for whom they have billed or ‘shadow’ billed the largest amount of core primary care services.